Biggest, Most Beautiful Campus in D.C. 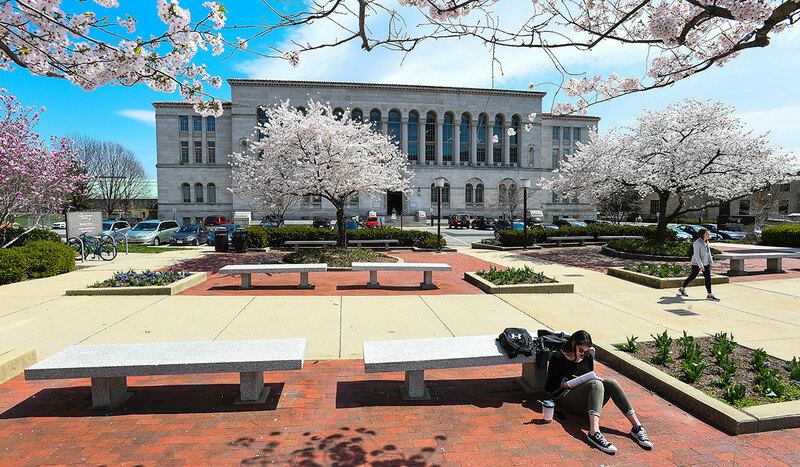 Welcome to the Biggest, Most Beautiful Campus in D.C.
Catholic University students have the best of both worlds: the culture and resources of a big city, and a beautiful, safe campus to call home. As soon as you set foot on The Catholic University of America’s campus you immediately sense that you are standing in a world within a world. On one hand, Catholic University’s location puts you in the middle of the major metropolitan city of Washington, D.C., less than 4 miles from the United States Capitol and the National Mall, and on the other hand, the peaceful, green and residential feel of campus gives you a belonging, a community, and a home. That feeling is a large part of what attracted sophomore Megan Boretti, a nursing major, to choose to attend Catholic University. Covering a span of 176-acres, Catholic University is the largest university in Washington, D.C., by land area. Campus features many green areas for students to relax and study, including a basketball court, outdoor cafeteria seating, and open park-like areas where students are frequently found picnicking or playing pick-up frisbee or soccer. 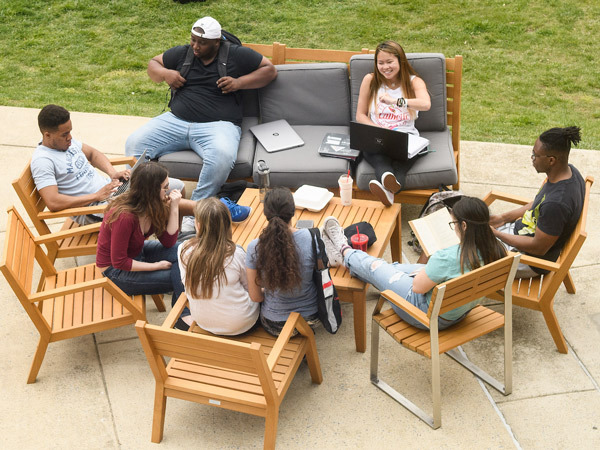 Most students live on or adjacent to campus for the entirety of their time at Catholic University, offering them the opportunity to take advantage of a four-year residential experience. After his sophomore year, finance major Stefano Bellucci (`20) moved to Brookland Ridge, an apartment community just beyond the north side of campus. Bellucci volunteers with the campus chapter of Habitat for Humanity and is the president of the consulting club, a group for aspiring business consultants. He is especially excited about the re-opening of Maloney Hall in the fall of 2019 as the new home for Catholic University’s Busch School of Business. The re-purposed building will feature brand new classrooms, a large auditorium, office and study spaces, and a chapel. The chapel will be the seventh chapel on Catholic University’s campus, offering students dozens of daily and weekend Mass times or a chance to stop by for quiet prayer and reflection in the midst of a busy academic schedule. “One of the most common themes among our students is that the thing they like the most about our university is the strong sense of community we have here,” Allen said. “ A community where people are serious about their academic studies but also where people support and lean on each other. Catholic is a fun place to go to school." While the feel of campus may be one more common in a rural setting, Catholic University students have the city of Washington, D.C., right at their fingertips. On Friday and Saturday nights, the Brookland-CUA metro platform is full of students headed to the city to see shows, movies or visit Chinatown or the national monuments. Bellucci, who hopes to stay in the city after graduation, appreciates the benefits of Washington, D.C., from a business perspective. “It’s a great place to connect with future employers, to discover new internships and to put myself on the path to where I want to go professionally,” he said. 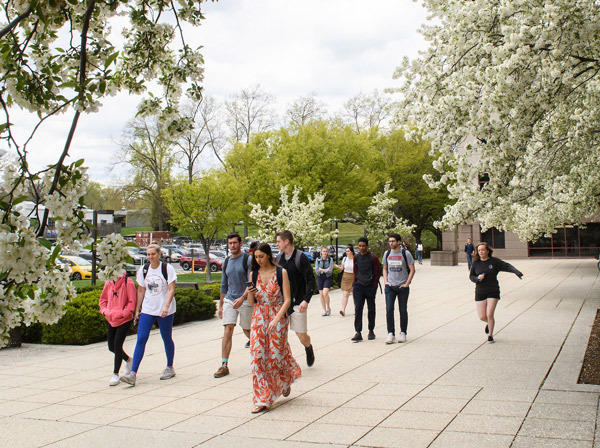 At Catholic University, students truly have the best of both worlds: exposure to the culture and resources of a metropolitan city, while at the same time having a beautiful, safe place to call home during their college years. Catholic University has the largest solar installation in the Washington, D.C. metropolitan area. Catholic University has been recognized as one of the most environmentally responsible colleges in North America. Students have access to green methods of transportation including the Metro system, Capital Bikeshare and ZipCar on campus. Catholic University was recognized in 2013 for being a Tree Campus USA School. Opus Hall is in the process of becoming the second LEED certified building on campus. Catholic University earned the honor of using the most green power among the schools in the Landmark Conference as part of EPA's 2014-2015 College & University Green Power Challenge. In 2014, the School of Architecture’s Crough Center became the world’s first school of architecture to be awarded with official LEED EB:O&M Certification, certified by its own students as part of a course.